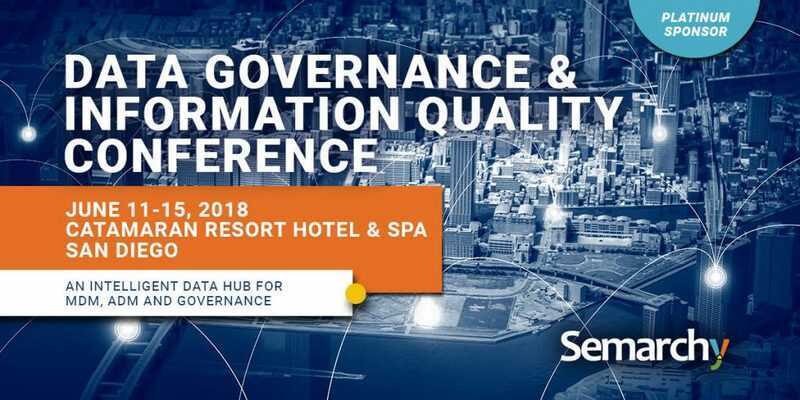 The Data Governance and Information Quality Conference (DGIQ) is the world’s largest event dedicated entirely to data governance and information quality. Semarchy was proud to be a Platinum Sponsor of this event featuring six tracks and more than 35 case studies. We led the conversation around how an Intelligent Data Hub addresses all of the capabilities in one single platform. Delegates had the opportunity to see that among a plethora of technology solutions, Semarchy stands alone in the ability to solve for most of the use cases that were discussed at the Summit with our xDM platform. Sam Zamora, Master Data Architect at PIMCO, joined DGIQ to share his success story. Sam talked about the system he was able to build at PIMCO, to master their contact, organization, and client office detail along with product, location and reference data, wrapped up with a bit of intelligent algorithms and batch processes to build an elegant solution. In this best practices session, Sam detailed his experiences work with the xDM Intelligent Data Hub from Semarchy to solve for governance, quality, enrichment and MDM in parallel. How to need to get your data situated in such a way as to take advantage of recent advances in data science, machine learning, etc. This session, led by Semarchy CMO Michael Hiskey and Senior Customer Success Consultant Robin Peel, focused on practical experience from GDPR implementations, and explored some solutions to help DPOs, data controllers, and processors address data subject access requests and associated compliance requirements. Lasting change is possible and affords a myriad of unintended benefits from increased intimacy with the people data in your organization.